Cars are sometimes described as 'nippy', the definition of which seems to be small, with a small engine, sharp steering and chuckability. But when I drive cars that other people call nippy I just get frustrated at the massive slowness of them. The new Renault Clio is a good example. Most reviews call it nippy. I called it slow. Well, OK I said the steering was sharp and precise as well but you get my drift. The Volvo V40 T5 is nippy. Nippy as in massively fast and with sharp and precise steering. Apparently it does 0-60mph in 5.7 seconds. It feels much faster than that. The engine has so much power it doesn't have a sweet spot, it just surges all the way to the redline. The 2.5 litre turbocharged engine produces 251bhp and 265 lb ft of torque, and the car weighs 1500kg. It has a better power to weight ratio and accelerates faster than a Porsche Boxster. The power is delivered to the front wheels via a 6-speed automatic gearbox. In normal mode the gearbox is fully automatic and perfectly fine, if a little leaden when driven enthusiastically. When required just knock the lever to the left and into Sport mode. Then the gearbox feels lighter and changes later in the rev range. Around town the car feels jerky in Sport, so you knock it back into normal. It becomes intuitive to slip between the two modes after a while. It has no steering wheel mounted paddles and, to be honest, they would improve the experience. Come out of a corner, or start an overtake, mash the throttle, wait half a second whilst the gearbox changes down then go. If it had paddles you could change down in anticipation of throttle mashing. Yes it does have manual gears on the gearchange lever but in an auto you want them as paddles. The steering is precise. It's easy to hold a line in corners until you put the power down mid-corner and the front wheels compete for grip. Yes it does torque-steer but not as much as the Megane 265 which wants to actually cross lanes into the oncoming traffic when you apply too many horsepowers. 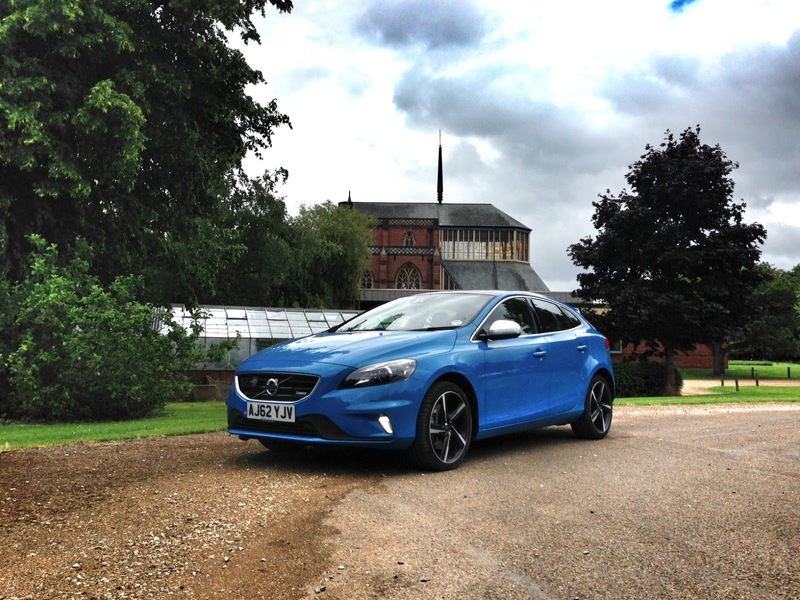 On terribly paved, tight cornered back roads the Volvo V40 T5 is a finely tempered fun-machine. On fast, sweeping roads the V40 is even more fun. On the motorway it's a mature cruise-mobile that drives itself with easy to tune adaptive cruise control. You can just press the switch and steer. The car slows itself down when idiots pull out in front of you. It comes with lots of assists. To be honest I was expecting the car to be so over-assisted that I'd find it annoyingly nannying but instead you choose the assists you want and turn the rest off. It aids rather than nannies. It parallel parks itself but I never tried that because I try and avoid roads where parallel parking is required. The parking sensors are the best I've ever used. Instead of just bleating because my wife's Land Rover is 1 foot to the right and the hedge is 2 feet to the left it actually tells you how far away objects are via ever increasing beeps, and visually on the in-dash screen. It tells you how many people are in the car and if they've got their seatbelts on - and then shuts up after a while if they choose to be naughty and not wear one. Unlike a Range Rover which beeps forever if some awkward old codger refuses to belt up. The interior is a masterpiece of ergonomic design. The materials are good, although the dashtop rubberised plastic has a strange grain. This is the first car in which I can almost emulate my favourite driving position - that in my Porsche 924S. Legs out, wheel in lap. Marvellous. The leather seats are comfy and supportive. You won't fall out when hooning round a decreasing radius corner. Actually when you do that the car oversteers ever so slightly. Which is nice in a front wheel drive car. My favourite gadget of all in the V40 T5 is the way the stereo integrates with your smartphone. It takes a minute to set up first time and thereafter you get in the car, press the start button (with the keys in your pocket) and a few seconds later your iPhone's playlist starts up from where you last left it, with crystal clear clarity. Brilliantly simple. And a better system in a £31k car than in a lot of £100k cars. The Volvo V40 T5 is an awesome car and a true hot hatch. It's a hot hatch for those of us old enough to remember the originals and who can wear a Motörhead t-shirt without any trace of irony. It is £6k more expensive than the (similarly awesome but slightly less classy) Renaultsport Megane 265 and Ford Focus ST. It's slightly faster and more refined than either and can be driven as a comfortable cruiser if needed. It also doesn't come with the backwards baseball cap and trousers-round-the-arse image that the Megane and Focus attract. If you're in the market for a true drivers car with masses of driver appeal plus a dollop of practicality then I'd advise you to buy one. Just make sure you spec it in Passion Red or Rebel Blue - it's a good looking car that is accentuated with a loud colour scheme.